Fig. 4-3-1-4 shows the number of persons cleared for Cannabis Control Act (Act No. 124 of 1948) violations, Narcotics and Psychotropic Control Act violations, and Opium Control Act (Act No. 71 of 1954) violations (including Act on Special Provisions for Narcotics violations concerning cannabis, narcotic and psychotropic substances, and opium, respectively; hereinafter the same in this subsection) over the last 20 years. 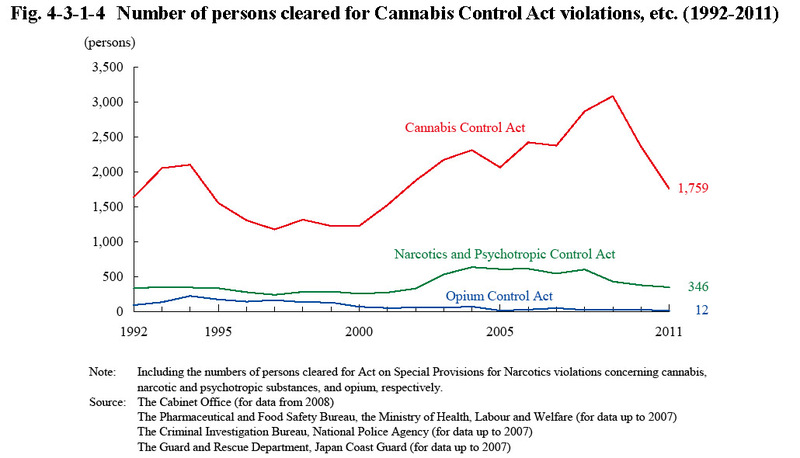 The number of persons cleared for Cannabis Control Act violations was on a significantly increasing trend from 2001 through to 2009. It then, however, started decreasing from 2010 and decreased by 25.7% from the previous year to 1,759 in 2011, but still remained at the high level of approximately 1.4 times that of 2000. The number of persons cleared for Narcotics and Psychotropic Control Act violations was also on a slightly increasing trend from 2001, but then started decreasing from 2009, and in 2011 decreased by 7.7% from the previous year to 346. Examining the number of persons cleared for Cannabis Control Act violations (limited to those cleared by the police) in 2011 by age group revealed that those aged 20-29 accounted for the highest proportion at 48.8% of the total persons cleared (Source: The Criminal Investigation Bureau, National Police Agency).